135 Reading the last chapter of Hebrews followed by a prayer for Rev. Woodburn. Opening song Rock of Ages was sung. Enthusiastic [consenture?] choruses were afterwards sung. Miss Lunetta Brown and Mrs Jesse Lord sang a fitting duet. after which Mrs. Wm. 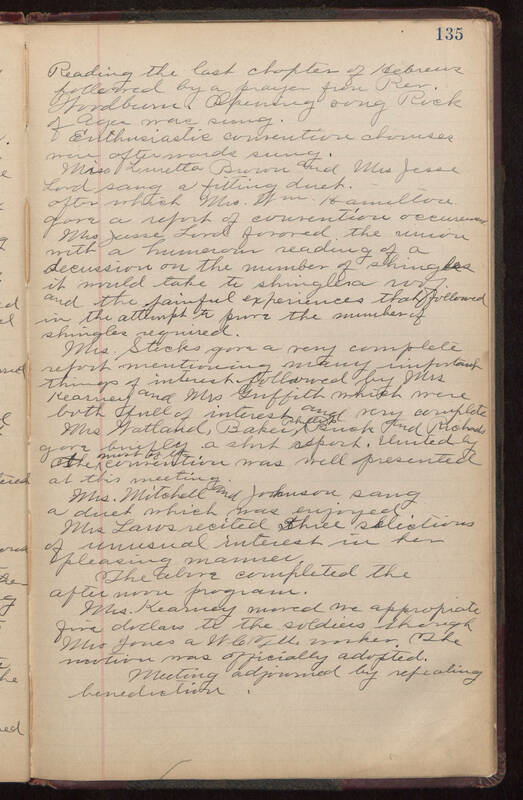 Hamilton gave a report of convention occurrences with a humerous reading of a discussion on the number of shingles it would take to shingle a roof. and the painful experiences that followed in the attempt to [purz?] the number of shingles required. Mrs Stocks gave a very complete report mentioning many important things of interest followed by Mrs Kearney and Mrs Griffith which were both full of interest and very complete Mrs Watland, Baker, Buck and Richards gave briefly a short report, United by most of convention was well presented at this meeting. Mrs. Mitchell and Johnson sang a duet which was enjoyed. Mrs Laws recited three selections of unusual interest in her pleasing manner The above completed the afternoon program. Mrs. Kearney moved we appropriate five dollars to the soldiers though Mrs Jones a WCTU. worker The motion was officially adopted. Meeting adjourned by repeating benediction.